My thanks to Ace and NetGalley for providing me with a digital review copy. No compensation was provided for this review, and all opinions are my own. The Royal Society of Unnatural Philosophers, one of the most respected organizations throughout all of England, has long been tasked with maintaining magic within His Majesty’s lands. At his wit’s end, Zacharias Wythe, Sorcerer Royal of the Unnatural Philosophers and eminently proficient magician, ventures to the border of Fairyland to discover why England’s magical stocks are drying up. But when his adventure brings him in contact with a most unusual comrade, a woman with immense power and an unfathomable gift, he sets on a path which will alter the nature of sorcery in all of Britain—and the world at large. Zacharias Wythe is having the worst year. Thrust into the position of Sorcerer Royal, England’s chief magic-wielder, the shy and retiring young man has unenthusiastically become the center of attention. And that attention is not positive, for there are few who will quietly accept a black man as their venerated Sorcerer Royal. When Zacharias is invited to give a speech on the dangers and uses of magic at a boarding school for gentlewitches, he gladly seizes upon the opportunity to escape the fracas in London. At the school he encounters Miss Prunella Gentleman, an employee slash indentured servant working at the school. Zacharias and Prunella immediately connect – at least on a magical level. The Sorcerer Royal is shocked by how powerful the mixed-race young woman is, and the ruthlessly practical Prunella capitalizes on this and leverages her abilities to help her escape drudgery in the country. Zen Cho’s world building in SORCERER TO THE CROWN is fantastic: she combines elements from traditional fairytales with classic comedy of manners tropes and infuses them with her own interpretation of a decidedly more global perspective on magical systems. I loved seeing the representation of people of colour in this novel, particularly given the Regency setting. As sad as it is, the oppression and outright malice that Zacharias – and to a lesser extent Prunella – experiences is very realistic and added palpable tension to the central plot of the novel. While Prunella experiences less direct prejudice than Zacharias, she is not blind to it, and often comes to Zacharias’ defense when he is slighted. Her frenetic energy combined with her relentless pragmatism and single-minded determination make for a lovable protagonist; I can safely count Prunella among my favourite heroines of 2015. Prunella is obviously a great heroine, but I was pleased to see that she wasn’t the only magically adept or otherwise badass woman in SORCERER TO THE CROWN. The sorceress Mak Genggang from the island nation of Janda Baik (a power that is resisting English colonial efforts) was a particular favourite of mine. Mak Genggang teaches Prunella spells that English magic either doesn’t know or understand, empowering her to learn more about her parentage…and where all the magic inside her comes from. Plus, there was a hilarious party-crashing incident wherein Mak Genggang almost took someone’s head off with a dagger at the event of the season. Whoops! I honestly laughed so hard during that scene. If you like your books witty, fun yet political, and you don’t mind some challenging vocabulary, then SORCERER TO THE CROWN is the book for you. 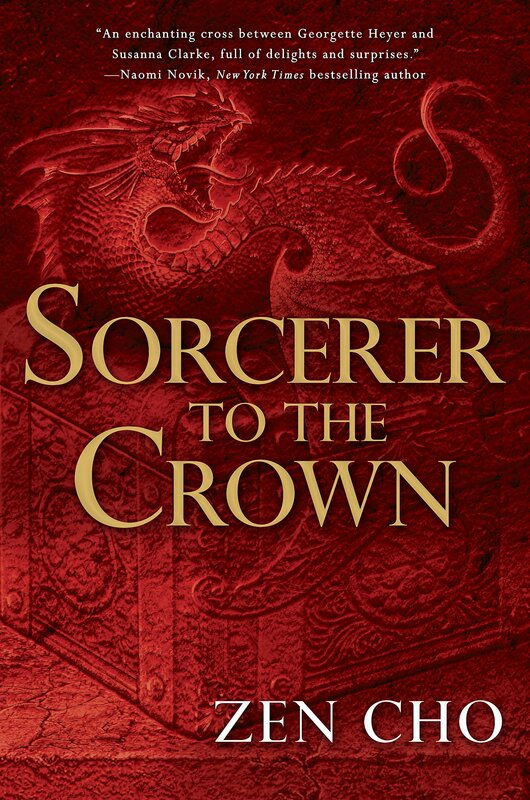 Have you read SORCERER TO THE CROWN? How great is Prunella? If you haven’t read it yet, who are your favourite heroines (or heroes!) of 2015 so far? Ha, yeah this has “Danya bait” written all over it! 🙂 Cho did such a fantastic job with it, I can’t wait to see where she takes the series from here. I love stumbling across new, fresh authors! I am always up for regency + fantasy! Great to see some POC characters front & centre. I’ll definitely have to check this one out! Same, I love regency fantasy novels! 🙂 I highly recommend this one, I think that Zen Cho is an author to watch. Ahh you and your tempting 5-star reviews! This sounds amazing. Prunella (who named the poor woman?) seems like my type of a heroine. But I’m extremely reluctant to start a new series 🙁 I just updated my post where I pledged I would finish more series and found out I’d completed four but started nine more, so… I’m really bad at this. LOL you are so right about her name…kind of unfortunate. I’ve been doing the same thing with series lately too, but focusing more on my UF series and trying to limit how many of them I have on the go. My original plan was to finish/catch-up on all the UF series I was reading before starting any new ones. I’m sure you can guess how that went, haha! This was such a good read – I loved it. Spot on review and definitely worthy of 5 stars. I finished this book today (yay) and I totally agree with you. Prunella wasn’t my favourite heroine of 2015 (I feel like occasionally she forgot to employ common sense before she acted, but other times she was too busy scheming and employing her intelligence to notice the obvious, which could be annoying) but she was awesome and it was nice to see a woman standing up for herself and going for what she wanted (even if she did think she wanted to get married). I know what you meant now about needing to look up words, I kept having to crack open my trusty dictionary because I just did not get some of the words. It meant the writing felt true to the time, but I don’t enjoy needing a dictionary to get some of the language. Great review for what was a really awesome book. YAY! I’m so glad you enjoyed this one, Becky! I’m always a little nervous recommending it precisely because of how complex the language is. Thankfully I read an electronic copy so it was really easy to look up words (just tap them to get the definition! I friggin’ love my iPad, haha). You’re right – Prunella is a lot of things, but possessed of common sense isn’t really one of them haha! She was such a determined go-getter, I really rooted for her every second of the way. Plus watching her slowly realize her true feelings about romance was ADORABLE. I have very high hopes for the sequel!